I woke up this morning to the first snow of the season. I thought once the sun came up it would go but it’s mid afternoon and it’s still on the ground. The fact that it snowed was somehow a signal to me to finish up a few projects in need of just a couple of hours of my time. My rug is a row of twisted fringe away from lying on the floor. Skeins of yarn were wound in anticipation of a new warp. Drafts were reviewed with the planning for Christmas in full swing. Twisting fringe gives you a lot of time for meditation and today I was thinking about what allows a person to do seemingly mundane, repetitive tasks that build into the finer crafts that I have been playing with lately. I used to tell my husband that there was absolutely no way to bore me as long as I had something to do with my hands. I think it comes from seeing multiple generations of my family always busy with their hands. From knitting and quilting to mechanics and wood working everyone was always doing something. I’m fortunate that they also thought it was important to pass on the knowledge and interest in one way or another. My interest in the things I learned when I was younger has grown as I age. When I was cleaning out the attic I came across the first piece of crewel embroidery I made with my grandmother. I think I was 8 or 9 years old. She bought some little kit and showed me the stitches. I would work them while she did some sort of handwork of her own I’m sure. If she wasn’t there my mother would show me what I needed to know. I learned many, many things from those women. I think the most important is the work of your hands can be a form of meditation. Doing the same small thing over and over allows your mind to work out the problems of the day (or week or month). Almost all crafts allow you to do this. There’s a learning curve to everything but there always comes point where the work becomes known and it’s only in the beginning stages that it requires concentration. Every new craft that I have learned to do I have always worked to perfection over whatever time it takes to do so. I will make one thing after another, honing my skill until I’ve worked it to death. For a number of years I made teddy bears, not ordinary bears but beautiful, jointed stuffed animals. The reason I did it? I needed to perfect the embroidery of their noses. Once I got to the point of knowing they could meet the expectations of even the harshest critic I taught others to make them. It finally ran its course. I know that if I decided someone needed a bear of their own I could make one with little effort and it would meet my exacting standards without the frustration of the first 10 or 20 bears that I originally made. Also, in making that bear now, I would be able to meditate my way through the entire process, think about its recipient and put more of my good thoughts into the gift. So it would appear to an outsider that I have craft ADD – and I do in some respect but it’s also a sick pursuit of perfection that drives what to others looks like a crazy, boring craft project. I will work a skill a little at a time until I master it and continue to learn the possibilities within the craft. That may be the appeal of weaving, I know there are so many aspects to it that it will take the rest of my life just to explore them all but there are little pieces of it that I can work until it’s perfected, then move on. I think that’s the way life is, you have to break it down into little pieces, perfecting or finishing it one bit at a time. Not everything allows meditation but with patience and practice it can all feed your soul. For me it’s all about finding that sweet spot in everything I do. Now the season has shifted once again and I bring out the things that have been waiting for months for my attention. In a few more months all I’ll want to do is dig in the dirt but for now I’ll be doing those cold weather projects. I finally started to weave my huck lace towels last night. After a frustrating start it went pretty well. This is one of those projects that you don’t really see the results until it’s been wet finished. I haven’t done this fine a weave until now and I have mixed feelings about it (mostly having to do with my eyesight). I will probably be happy these are dishtowels once they are finished, the perfection of the weave pattern doesn’t matter when you are drying off your pots and pans. I haven’t woven at all for a couple of weeks and it felt good to be back. I have been having a tough time getting back into that Zen mode, there is too much background noise. Things will settle out, like they always seem to do. Maybe not settle out physically but I will be able to move through it emotionally and find that place where the meditation of handwork can bring me peace. I often wonder how other people bring themselves back from the brink. The act of doing something with my hands is what allows me to work through the issues of the day (week or month), even if it’s just playing solitaire with real cards or folding a few cranes. So I will work my way out of this by weaving, or knitting, or hooking. I will have some beautiful things when I am done but most of all I will have peace of mind. I’ve lived in a few places. Work, family, friends, lovers have all taken me all over but I always have come back to Rowe. A person I grew up with told me that this town was part of his soul, he hasn’t lived here since 1975. I know that feeling, where you drive into a place over a familiar road not seen in a while and something happens, you feel it in your gut, that little flutter. You know you are home. I live in two worlds, fortunately they are close enough in distance so I can escape one for the other. Just for my own comparison I snipped out the vital info about Rowe and Enfield. Rowe with its 24 square miles and 393 people compared to Enfield with its 34 square miles and 44,654 people at last count. That means there is .49 acres per person in Enfield and 39.09 per person in Rowe. No wonder I feel like I’m suffocating while I’m in CT. That’s probably not a fair assessment but it does speak to the rural vs. urban/suburban situation I find myself in. You will also notice the difference in temperature and dew point. In the summer it’s a difference you notice, in the winter it’s night and day. The growing season is at least 2 weeks ahead in Enfield. The last frost is something we see at the end of April. In Rowe there is nothing that goes into my garden earlier than Memorial Day – ever. The one difference I truly notice is the quiet (and solitude). In Enfield there is air traffic over our house close to 24 hours a day – we are on the landing path to Bradley in CT. I think at night I can see the people sitting in their seats as they fly in for a landing. The street we live on is very busy and we are within hearing distance of the railroad tracks where Amtrak runs during the day. Yes, planes, trains and automobiles – the noise never ends. Everyone is always in a hurry to get nowhere as well. You have to be a fairly aggressive driver in this harried place. In our spare time in Enfield we can work on the house (with our neighbors chatting us up over the fence), shop or eat at a chain restaurant. I used to have very large perennial gardens around the house but it’s not the quiet, meditative project that it is in Rowe. Now I look at what I can dig up and move, turning the yard back into something that can just be mowed. When I get home to Rowe everything slows down. The driving, the breathing, the thinking – once I arrive there is nowhere I need to be but there. There is enough to keep me occupied for days on end without ever leaving the property. I breathe the clean air, listen to the birds, contemplate life. My bedroom window is open at least three seasons so I can hear the owls at night and the birds wake me up in the morning. I can drink my cup of coffee watching the sun rise over the back forty and the mist dissipate in its heat. My new year’s resolution for 2012 was to fold 1,000 cranes. I once met a kid, a little girl about 10 that had folded 1,000 cranes. She was amazing, my kind of girl. She loved crafting of every kind and totally got it. Her brain worked like mine. I only spent a couple of weekends with her because her father worked at the same facility I did at the time. I wanted to take her home and transfer all of the crafting knowledge I had and watch her run with it. Didn’t happen. Oh, well. Back to the cranes. I figured if a 10 year old had folded 1,000 cranes I could do it and it was really a cheap little project. 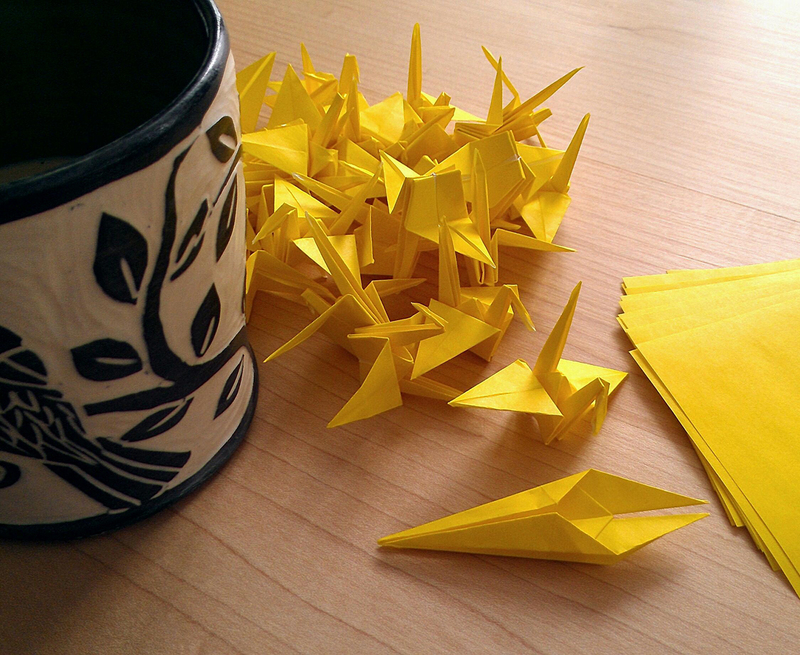 By February of 2012 I had folded over 600 cranes. The project was derailed when my father had a stroke and I spent a few months getting him (and me) settled into a different life. Last week I found a box with these cranes in it and the remaining paper. I took it to the table and started to fold. It’s amazing that after months away from paper folding my hands remembered exactly what to do. I find doing this to be very meditative. It is calming and I can think about things as my hands are doing their work. I think that really is the point of folding cranes, the meditation, even though the idea is to bring good luck to the house that has them. So I decided to move my 2012 resolution to the bucket list. This way there is pressure to finish them but not within a certain amount of time (well, there is a finite amount of time). The thing is I can see myself folding another thousand once these are done.